Most smokers (and non-smokers) are aware that they are risking their health by smoking tobacco or passive smoking, but many don’t know to what extent or how it can harm the throat. Smoking tobacco is not simply limited to cigarettes as the risks refer also to the use of cigars, pipes and even chewing tobacco. The quality of the tobacco and how much it costs does not matter either as all forms are harmful to health, though some brands may contain higher levels of tar, nicotine and a more dangerous mixture of chemicals too. 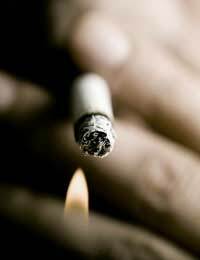 There are several reasons why smoking causes coughing. Mostly it is due to the irritant nature of the smoke and the chemicals. The smoke also dries the throat leaving it difficult to swallow as the tissues are dry.The heat contained in cigarettes, cigars and pipes is also damaging and can burn the throat and dry it out even further. Smoking can seriously harm your voice and is a definite no-no for those who rely on their voice for their job. Not only will the tissues of the larynx become red, inflamed and dry, but can thicken too which can significantly alter the sound of the voice and its ability to perform. There is also the chance of developing polyps of the vocal chords which will alter the voice and may never recover to the same degree and quality as before and may need surgery to remove them . The biggest cause of cancers of the mouth and throat are due to smoking. The risk is even larger if the smoker is a regular drinker of alcohol and most smokers admit that they smoke more when drinking so the risk is particularly high for this group.The cancer is primarily caused by the tar and the potent combination of chemicals that are included in the tobacco, especially cigarettes that contain high levels of toxic and carcinogenic chemicals. Mouth and throat cancers can be difficult to recognise as the symptoms can be hard to spot early on. Even so, if the cancer is caught early, the recovery process can be very slow and leave the individual with some very nasty scaring and disfigurement as often the tumour needs to be surgically removed, frequently with some surrounding tissue or even bone. This can be difficult to reconstruct and may require the patient to re-learn the how to eat, swallow and speak. It is not just those who actually smoke the tobacco who are at risk as those who spend time in a smoky atmosphere are also at risk. By indirectly inhaling the smoke, we are still absorbing some of the chemicals, including those that cause cancer. Smoking has no benefits to health whatsoever and those who participate are significantly increasing their chances of developing many dangerous and potentially lethal illnesses. It is never too late to quit and there is now more help than ever before around to help you break your habit.